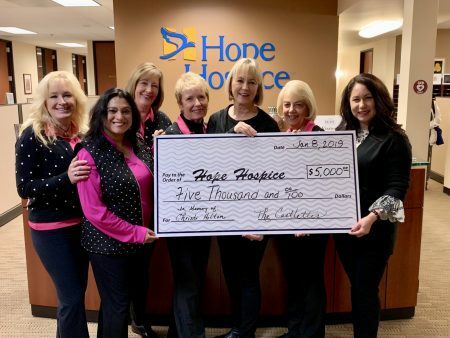 Members of the Castlettes, Castlewood Country Club’s women’s nine-hole golf group, presented a ceremonial donation check in the amount of $5,000 to Jennifer Hansen, Hope Hospice CEO. Each December, the Castlettes host a charity holiday luncheon benefiting several local organizations, and Hope Hospice is always at the top of the list. This year’s event, themed “Mistletoe and Mimosas,” was co-chaired by Kala Swaminathan and Michelle Hodges. They and other members of the Castlettes generously donated more than 65 items for the raffle and auction and also solicited businesses for donations. The group also provided 42 Secret Santa gifts to the Seniors of the Tri-Valley and donated several bins filled with toys to Toys for Tots. Castlettes pictured from Left to Right: Nicole Murray, Kala Swaminathan, Connie Cannella, Sue Anderson, Maureen Shevlin, Julie Blau, Jennifer Hansen, Hope CEO.